At View Point Resort we don’t believe in taming nature. With this in mind, our Thai designers have artistically crafted beautiful organic spaces that fuse architecture and nature. All constructed by hand using local raw materials. 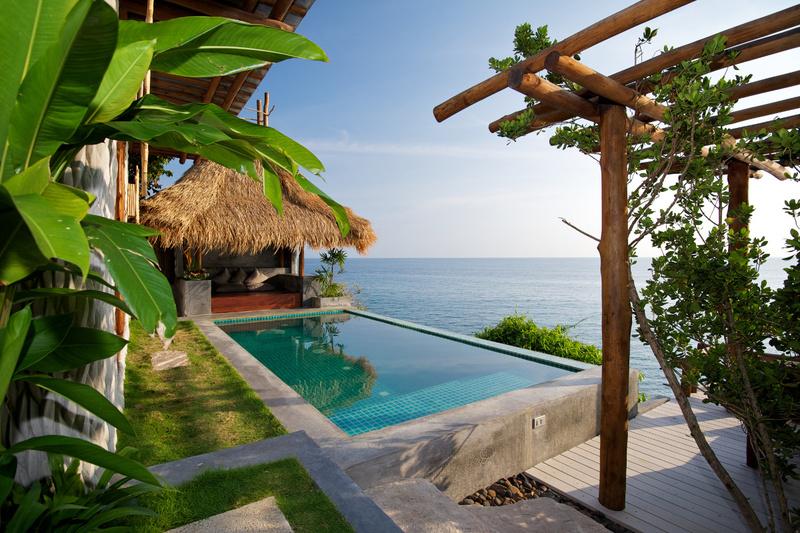 Each of our Villas and Cottages are uniquely designed around the natural landscape. All accommodation and facilities are accessible via paved pathways and a number of stairs. Small children: Whilst it is possible to use a buggy on the paved pathways and stairs, it could be considered cumbersome for people with small children when accessing facilities. Guests with reduced mobility, must contact us before booking. Our open plan pool villas are designed to allow our guests to get very close to nature, while still retaining the comforts of a modern cottage resort. Our remote location means a 100 meter jungle walk to reach the beach. View Point Resort offers relief from the hassle, noise and complications of civilization. Our guests can relax deeply and privately in the warm waters of their own infinity pool, knowing that our friendly helpful staff is close at hand to fetch them anything that the island has to offer. A perfect blend of nature and modern comfort. These spacious and modern cottages are built into a slope and directly overlook Chalok bay. The cottages are located a few metres away from the beach and a mere stroll to the restaurant, bar and pool areas. Sit on your balcony at sunset and enjoy the gentle sound of the waves lapping at the shore every evening. Beautifully octagonal in shape crafted cottages. All command panoramic 180 degree views overlooking Chalok Baan Kao bay and the mysteriously reknowned Buddha rock and all have a most wonderful tropical back garden. These magnificent organic spaces have been created by artisans who have crafted each cottage with meticulously impeccable traditional wooden features. Each cottage has an amazing tastefully terrace lounge accommodating after day exploring the island with views that will take your breath away. In addition these cottages incorporate a tastefully done up en suite bathroom with all the amenities you would expect to have available to meet your needs on this luxury holiday. These gloriously stunning organic spaces are nestled away in the midst of the jungle that surrounds them. They have been carefully crafted to merge gently into their natural environment and provide you with access to delicate views of the sea and naturally designed walking paths that lead you into the delightful sounds and scenes of an untarnished nature.